Air movement specialist Fanquip has upgraded its portable blower, extractor and purging fan technology to maintain high durability standards demanded by heavy industries including engineering, mining, public works and council maintenance, food processing and industrial occupational health and safety. With relocatability playing such an important role for equipment of this type, all of this technology is highly portable and designed in a way to maintain safe operating levels for those engaged in using it. Made of tubular frame aluminium, the Fanquip portable blower extractor is extremely easy to carry despite the very robust construction. Available with five metres of flexible ducting, the system includes a capture hood and can be configured as explosion proof if required. Sizes range from 160mm-200mm diameter, motor power from 0.6 W to 1.5kW and air volume movements of 450 L per second to 890 L per second. These Australian made products come in a lightweight aluminium case with five meters of ducting. As these are constructed with a tough transport frame, they are well engineered for frequent relocation and can take all the knocks and bumps industry has to offer. Also available in an explosion proof model on request, its sizes range from 300mm-400mm diameter, with motor power from 1.1 kW to 2.2 kW and air volume movement of 1200 L per second to 2500 L per second. 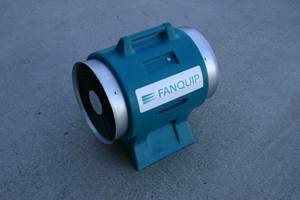 Fanquip purging fans are constructed in a lightweight but strong aluminium case and are assembled to include inlet/outlet guards. They can perform either an exhaust or supply function. Often they are used to extract dust, smoke and fumes to make the operating environment safer. Sizes range from 300mm-600mm, motor power of 0.18kW – 0.37 kW and air volume of 600 L per second to 2500 L per second.